Have you ever considered giving coding a try? The society for Computer Science, HackSoc, is hosting an introductory workshop on Python programming for beginners as part of the YUSU Give It A Go week, with no experience required. Admission is free, and open to all students of the university. 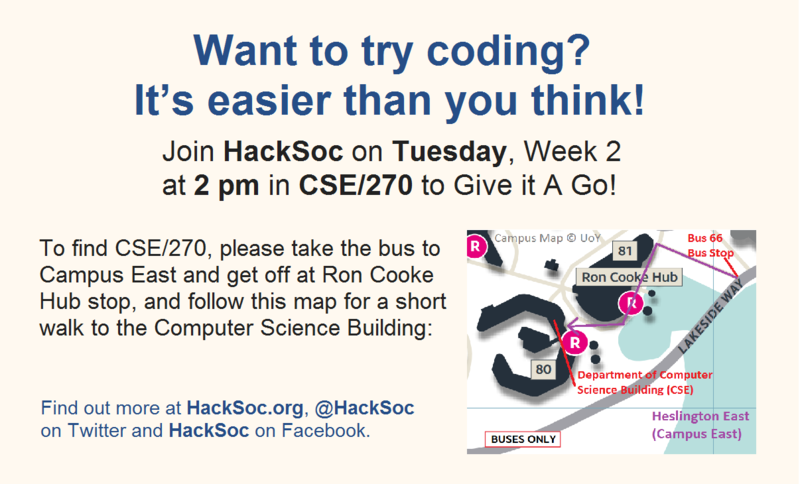 Simply show up in CSE/270 (Department of Computer Science, Heslington East) on Tuesday Week 2 (Jan 17) at 2 pm, and we will get you started! This is a workshop aimed at students from outside the Department of Computer Science who may be interested in learning programming.